SPECIAL STAFF REPORT Who will be the next governor? THE RACES for governor in Illinois over the years have always managed to stimulate a large amount of controversy and excitement. This year's contest between Democrat Michael J. Howlett and GOP newcomer James R. Thompson is no exception. In a year when the national Democratic party has managed to come together in a rather unusual display of unity behind Jimmy Carter, the primary campaigns of Gov. Dan Walker and Secretary of State Howlett split the party in Illinois right down the middle. Walker claimed that Howlett was too closely tied with Mayor Richard J. Daley of Chicago and foresaw Daley controlling the state if Howlett were elected governor. Adding salt to the wound. Walker uncovered and revealed that Howlett had occupied a vice presidency with the Sun Steel Company of Chicago, receiving $15,000 a year while serving as auditor of public accounts and secretary of stale. Walker charged that Howlett had been involved in a conflict of interest when occupying both positions at the same time, but in September a circuit judge held that no conflict, of interest had occurred. Howlett shrugged off the charges arid won a narrow victory over the incumbent governor in the primary, carrying 63 per cent of the vote in Cook County, but losing every county outside of the Chicago area. In almost completely opposite circumstances, Jim Thompson eased to the Republican nomination., claiming 86 per cent of the vote over an inexperienced, and possibly less motivated opponent, Richard Cooper of Winnetka. Thompson stood .in much better position after the primary than did Howlett — the Republicans indulged in very little name-calling and Thompson could count on the strong support of Republicans statewide. Thompson, the former United States attorney in Chicago, bridged the gap in the polls by primary time, but many political observers believed that Howlett would resume a commanding position when memories of the Sun Steel controversy had faded from the public's mind. But before long, the conflict of interest charges had come back to haunt him. When Walker and his cabinet director, Ronald Stackler, who was running for the attorney general nomination at the time, first disclosed the conflict of interest charges, they turned the matter over to Republican Atty. Gen. William J. Scott and demanded that he file a civil suit to recover the amount Howlett had earned with Sun Steel. On March 5, 1976, Scott named former Supreme Court Just see Marvin Burt as special assistant attorney general 10 investigate and advise whether such a suit should be filed. Burt issued a report to the attorney general on July I9, 1976, stating that Howlett was in a position of conflict of interest from September 14, 1973, to February 1, 1976, when he terminated his relationship with Sun Steel. interfere with his duties and obligations as Auditor of Public Accounts" and could be terminated at any time he wished, according to the Burt report. Burt stated that there was no evidence indicating any conflict of interest from 1962 to 1972, when Howlett served as state auditor. The Kaplan family business complex, which controls Sun Steel, is heavily involved in the scrap iron and steel business. A major source of this scrap is wrecked, abandoned or obsolete auto-mobiles, businesses like Sun Steel must bear the expense of junking certificates and license fees and the record keeping responsibilities involved in "de-titling" autos. This is where the alleged conflict of interest arose. Two bills were introduced into the 79th General Assembly which would have greatly benefited those who process vehicles into iron and steel. The first, House Bill 2825, would have exempted those processors from obtaining licenses and junking certificates from the secretary of state. According to Hose Majority Leader Gerald R. Shea (D., Glencoe), H.B. 2220 was inserted at the request of Howlett and would release scrap processors from filing reports and surrendering titles at the time they scrap vehicle hulks. Howlett asserted that his staff drafted the proposals, that he was not personally involved in the planning of them and that he never did see them. Ultimately, Howlett's staff received instructions to sustain Gov. Walker's veto, according to the Burt report. By virtue of his position as secretary of state, Howlett automatically became chairman of the newly created Vehicle Recycling Board on September 14, 1973. Created by statute, the board was responsible for drafting programs dealing with the recycling process of wrecked and abandoned automobiles. It was not demonstrated that Howlett's position on bills pertaining to the scrap metal business was influenced by his annual salary from Sun Steel. However, in Burl's opinion, elected officials should not place themselves in positions where personal interests could be a determining factor. Burt wrote, "Illinois case law clearly established that a public official owes a fiduciary duty of undivided loyalty to the public and may not. knowingly place himself in a position of temptation to act contrary to the best interests of the public." "The controlling fact, however, is that the dual relationship created a posture of temptation and conflict which should have been rejected at the outset," added Burt. "I am mindful that judged by standards and ethical expectations of an earlier day, such oversight might have been viewed as excusable. But . . . recent decisions of the Appellate Courts have defined a clearer path of duty and a higher expectation of ethical awareness." Burt concluded, "I, therefore, conclude that Mr. Howlett was in conflict of interest from September 14, 1973, until February I, 1976, the effective date of his resignation of his engagement by Sun Steel Co. and the cessation of the $15,000 annual payments." THE CANDIDATES for lieutenant governor cannot be voted on separately any longer. Incumbent Lt. Gov. Neil F. Hartigan is teamed with Michael J. Hewlett at the top of the. Democratic ticket, and newcomer to statewide politics. Dave O' Neal, is James Thompson's running mate on the Republican ballot (see p. 9 for background and interview of O'Neal). The other candidates for statewide offices have thrown their snips and tried to capture attention to their contests through the maze of presidential and gubernatorial campaigning- The office of attorney general has incumbent William J. Scott, the Republicans' most traditional statewide vote-getter, pitted against Senate President Cecil A. Partee, the Chicago Democrat, who could become the first black statewide executive, if elected. The last spot on the ticket, the comptroller, pits Republican incumbent George W. Lindberg, against Democrat Michael J. Bakalis, who served the last elected term of state superintendent of public instruction. After voting for the top candidates, voters may pick and choose between the Republicans and Democrats as they look down the list of candidates for executive offices. Who wins - and by the most votes — may give a hint at possible candidates for governor two years from now, when Illinois will begin electing its governor and lieutenant governor for four-year terms between elections for president. was that it was politically motivated. He filed suit on July 22, 1976, in circuit court asking for a speedy ruling on whether his situation had constituted a conflict of interest. This led to a ruling in the form of a declaratory judgment by Judge Raymond K. Berg of the Cook County Circuit Court on September 8 holding that no conflict of interest had arisen in Howlett's relationship with Sun Steel. Atty. Gen. Scott said he would appeal the ruling, and Thompson continued to be critical of the relationship. Despite his solid legal background including his most recent position as federal prosecutor in Chicago, Jim Thompson was relatively inexperienced when it came to the political arena, especially one in which Mayor Daley was involved. But ever since he announced his candidacy for governor on July 2, 1975, he has taken enormous strides in gaining public support. What many political observers labeled as a flaw in Thompson's technique, his determination to make a stand on every available issue regardless of the political consequences, has attracted many voters in downstate areas. Thompson's name was not a household word downstate when he first announced that he was a candidate, but it was well known throughout the Chicago area for his successful prosecutions of many top-ranking Cook County officials. Among them were Alderman Thomas Keane (next to Mayor Daley, top ranking Democrat in Chicago), Alderman Paul T. Wigoda (No. 2 man in Chicago's City Council) and Daley's press secretary, Earl Bush. Thompson began his career as a prosecutor in the Cook County state's attorney office in 1959 before moving on to the faculty of the Northwestern Law School in 1964. In 1969, Atty. Gen. Scott appointed him as chief of law enforcement, and he served there until receiving his appointment as first assistant U.S. attorney in 1970, and as U.S. attorney one year later. One of Thompson's biggest cases was the conviction of former Democratic Gov. Otto Kerner in 1973 on bribery, conspiracy, mail fraud, income tax evasion and perjury. Not a few people held this conviction against Thompson _ Kerner was generally well liked as a governor, but Thompson looked upon the case as something that had to be done. He also spoke out early on Watergate, stating that the guilt should fall into the lap of President Nixon. This stirred reaction among Republicans, since his comments came some time before the investigation pointed towards guilt of the former president. Thompson encountered some difficulty when launching his campaign for November, since his early strategy was premised on the belief that Walker would be the Democratic candidate. But thanks to Walker, Thompson was supplied with plenty of ammunition against Hewlett. The Republican did not turn his campaign into a mudslinging contest, but he has come out strongly against some of Howlett's actions at a time that some observers felt to be premature. A major fear among GOP leaders was that Thompson hitting Hewlett too hard too early might create sympathy for the Democratic candidate by election day. And Hewlett backers felt Thompson was firing his shots too early and would be out of ammunition by the time the "real" campaigning began after Labor Day. 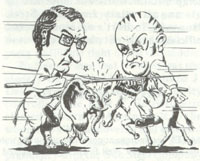 Besides the Sun Steel issue, Thompson lashed out against Howlett by accusing him of what virtually amounted to bribery. He stated that the secretary of state promised oil producers in a meeting in Olney that he would work to reduce workmen's compensation rates "in return for their $3,000 contribution." Hewlett denied the agreement and Thompson later regretted his grave accusations. The biggest issue hit by Thompson was Howlett's supposed lack of ability to state his position on certain issues. The GOP candidate challenged Hewlett to a debate, but was first rejected. They finally met face to face at the Illinois Press Association's meeting in Springfield on September 24, but it seemed lost in the shadow of the Carter-Ford debate held the night before. Michael J. Howlett is no newcomer to politics. With a strong background in business and public administration, he entered politics in 1960 as the Democratic candidate for auditor of public accounts. Since then he has become the first Democrat in Illinois who was elected to four consecutive terms of office, the last one being secretary of state. Hewlett is of the old school of politicians. He has used his influence as a public speaker throughout the state this summer, addressing crowds at factory gates, courthouse lawns, street corners and other gatherings. He has posed for pictures atop a horse in a barnyard, wearing a sombrero and entering a coal mine in a miner's uniform. He most assuredly has a special knack for attracting attention. More than this, however, he can proudly boast about his record as a public administrator for the past 15 years. While Hewlett has continued campaigning in his time-tested manner, Thompson has conducted an outright campaign based on issues. Both methods have their advantages and disadvantages. Thompson speaks out on the issues, but has been accused of being bland. Hewlett uses attention-grabbing methods, but has been criticized for not being specific enough on the issues. Finally, there are more similarities than differences between the two on the main issues of the campaign. Both Hewlett and Thompson have pledged to help farmers, fully fund the school aid formula, raise the state inheritance tax exemption, and cut waste in state government. Neither had spoken with much fervor about tax increases, until Hewlett pledged September 15 that he wouldn't run again in 1978 if taxes were raised while he was governor.